Use pavers of complementary colors and textures to create a coordinated, harmonious outdoor space. Lighter tones open up an area while darker ones make a space feel smaller and more intimate. 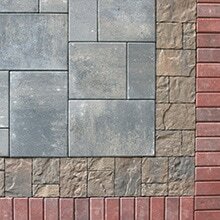 Add depth to your space by blending pavers of similar tones. Pair pavers in the same collection—Natural, Classic and Transitional—for complementary textures that define outdoor sections yet offer a smooth transition from one area to another. 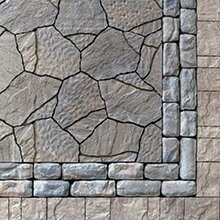 Combine pavers of contrasting colors and textures to create an intricate and aesthetically appealing design. 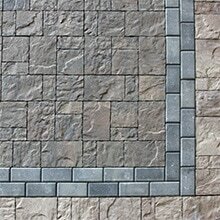 Define your space by using dark paver colors to line an area of light color, or vice versa. Add depth with contrasting textures. Use pavers from different collections—Natural, Classic and Transitional—to pair contrasting textures to accent your outdoor area and add visual appeal. ​Simply drag and drop various borders, accents and color swatches next to each other and start to envision the possibilities! Once you have narrowed down your favorites, order the full scale Uvision™ sheets and play some more on the driveway, patio, walkway, or pool deck!